The approaching UN General Assembly summit on refugees and migrants promises to bring attention to humane and coordinated approaches to addressing the needs of the millions of displaced individuals around the world. But even before the current conflict in Syria resulted in more than a million Syrians fleeing to Lebanon, the small country was already home to nearly 600,000 refugees from other Middle Eastern countries. Fortunately, some Lebanese have seen refugees not through the lens of being a problem, but as being assets to the economy, culture and to helping reduce conflict in Lebanon. Ahlouna, a nonprofit organization in the town of Saida, an hour's drive from Beirut, has worked with marginalized communities in Lebanon since 1997, providing job training, education, humanitarian aid, financial assistance, psychosocial support and more. Currently, its major operation is a bakery that solely employs refugee women from many corners of the Middle East. Five days a week, the women expertly hand-make catered cakes, candies and more. I recently had the privilege of visiting this bakery. None of the 45 women are professional bakers, but far from seeing this as a disadvantage, Ahlouna director Rashid Hamdou is delighted that his is not a typically trained staff. He likes their fresh approach to their work and is pleased they have learned a trade for which they are steadily compensated. "We are proud our products are made by unskilled women with no professional training or education. Many of them are illiterate and they're supporting their families," he says, adding that now that the women are known, and respected for their skills, they are considered part of the local community. And having had the privilege to sample their goods, I can attest that the bakery items are delicious, fresh and top quality! When it opened its doors in 2005, the business was in a unit the size of an apartment. It could fit only 10 people, and it had just one chocolate-making machine. But as demand soared, Ahlouna and Global Communities, with whom it partnered, saw the opportunity to create jobs within the community. A generous Ahlouna board member donated land (a limited and expensive commodity in Lebanon) and Global Communities helped build a new facility. This helped Ahlouna fulfill its mission: to empower poor refugee women in Lebanon by providing them with options to earn, and ways to engage with their communities. And as the business expanded, so did its revenue. Solid support from women-owned businesses in the area helped too. The focus has been and remains on opening up doors for women. Ahlouna does not focus on nationality; it improves the lives of poor women by training and employing them for the long haul. Many people have been with them since they opened their doors in 2005. First, the bakers earn salaries that are higher than average market rates, along with health insurance. This is very unusual in Lebanon, especially for women. Also, the entire board works closely with the employees, for no pay. They constantly look for ways to cut costs, such as holding fundraisers at private homes so that all the proceeds are invested back into their nonprofit business. Also, all their products meet exacting industry standards -- high-quality, hand-made goods keep customers coming back for more. 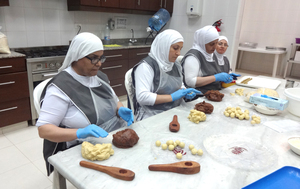 Providing training and jobs to bakers was the initial component of Ahlouna, but it has added several projects to help strengthen the community. Health care at home, job training and placement, business management, food assistance, psychosocial support, school subsidies, home visits to the elderly, caring for children with special needs, sanitation and hygiene education. They work with nearly 2,000 families on an ongoing basis, so they know their needs and have the connections to get them the help they need. But they know that especially in a crisis as dire as this one, needs will evolve and situations will change. For this reason, Ahlouna conducts quarterly needs assessments to ensure they are providing continuous and helpful support. Their aim -- and they succeed -- is to provide support for people in their communities and to provide services for whole families. It is essential to help communities that are accommodating an influx of newcomers as the war next door in Syria drags on. Global Communities' contribution to Ahlouna took place in 2008, and the catering business continues to expand today. I was proud to see that our partnership had produced a sustainable, local solution to the needs of women refugees in Lebanon, and to see it complementing our current work with Syrian refugees and their host communities in Lebanon with support from United Nations High Commission on Refugees. Hamtou tells us that although anti-American sentiment in Saida is widespread, the business has helped break down barriers and open eyes. "We are really proud to say we work with the USA; we say it bluntly and clearly. They came, believed in us and our value and they help us." It is incumbent on those of us who work in global development to partner with and support similar projects that do not just help people survive, but actually sustainably thrive. More projects like this in areas affected by the Syrian conflict will help ease the strain on community resources, stimulate financial growth, improve relations and support those who support themselves.